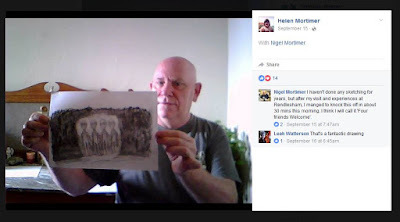 Brenda Butler is a well known name within ufology in the UK. Brenda was the first civilian to investigate the events, she is integral to the unfolding story we call the Rendlesham Forest Incidents. Over the past 35 years she has interviewed the witnesses, written a book called Sky Crash, given nowhere near enough talks on her research and thoughts, but she has been out there walking the walk, literally, for three and a half decades. All that could soon come 'Sky Crashing' down due to the intended actions of one man. For decades Brenda has been held responsible for almost every incident happening in that forest at night whether she was there or not. So connected to that forest is she, people often refer to it as Brendlesham Forest. Over the years Brenda has formed a good relationship with the Forestry Commission. She keeps everything as low key as possible, tells people to form small groups, stay safe. If you injure yourself in that vast forest at night it might be impossible for people to find you. Brenda can not do tours, she cannot charge money, she cannot take large groups and so most of the traffic on a night is nothing to do with her, but is tolerated because people abide by those guidelines. It is only because of the relationship she has with the Forestry Commission that anyone is allowed in there on a night. They would really rather people did not go in at night at all. As you read on you will see how these walks are now completely under threat. New Ufology, The Ultimate Ultimatum. Some months ago I talked about a new ufology, a new ideal within ufology, after all what could possibly be new apart from the way people behave? 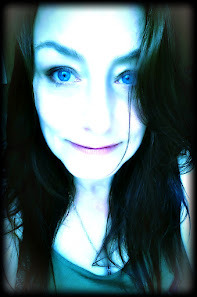 After writing the blog Alyson through the looking glass and publishing it on the 19th of August, ending it with the terminology "A New Ufology". 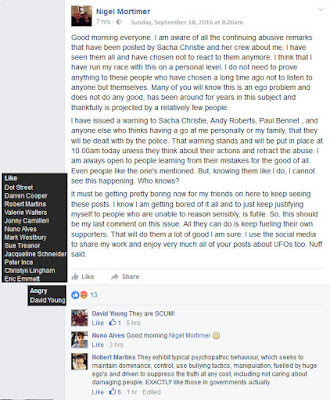 Sue Demeter St Claire left a comment underneath saying "Here's to a new ufology". My version of a new ideal would be to have events where we hear from the witnesses and experiencers themselves. No researchers just for once, we want to hear from and talk directly to the people who saw it and lived it too. By the 22nd of August, Nigel Mortimer announced he was putting on a conference and was calling it New Ufology. The line up consisted of my friends and some who were far from friends. I was unperturbed by this, why would I begrudge my friends an opportunity to do the very thing they do? I wasn't going to put on a conference called New Ufology anyway. By the 25th of August the advertising of this event was in full swing. So was the obsessive postings about me after calling him a snakeoil salesman and for running off with a couple of words that mean nothing on their own. He admitted in a letter to Alyson Dunlop this week that he was talking about a 'New UFO Awareness' event for three years but suddenly decided to call it New ufology and it has nothing to do with me saying it because basically it is the same thing in a five page letter to Alyson Dunlop imploring her to find the goodness in herself and not listen to anyone but him. "The agenda (for them who have short term memory loss?) that started with Sacha Christie (and a couple of others who sidled up to her then and have raised their mugs again now) 3 years ago when I was gong to start the 'New UFO Awareness' conference (the same idea as New Ufology tbh) then, is all that this is really about. Yes, I am an easy target because I claim extra-ordinary things like channeling, psychic awareness, etc., but one thing I do not do is attack people for no good reason at the very personal level. 'SW' is just carrying on that which SC started back then, without concern for anyone but himself or others"
Below is a strange comment considering SW has literally nothing to do with Ufology at all. He is just a man who uses Facebook and happens to live in Woodbridge, Suffolk. He is also claiming in this letter about SW to Alyson Dunlop that is that SW is doing my bidding. So really, this is just another way for him to keep talking about me obsessively because I don't think he can open doorways to other dimensions or anything else for that matter. He has told Nigel this several times, he has also stated that he is not acting on my behalf, nor has he ever. 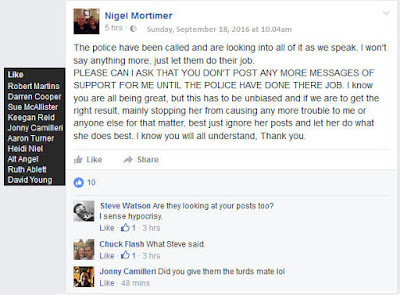 Nigel told people in his "I'm not a bully" video that if they were friends with me then they are not decent people and backs a man who called everyone connected to me 'brainless scum' then blames me for the backlash of insulting around 7000 people connected to me through any one of my THREE (not 30!!) Facebook accounts. ".Find the goodness within you Alyson, and tell this trouble causer 'Steve Watson', where to go. Preferably out of the subject and far away from us all" . I'm not a bully, you're not decent people video. As everyone involved knows, I was going to be visiting them all in September in Suffolk and we were going to discuss recent events and have a social evening too. Nigel beat me to it. So off he goes to Rendlesham Forest and lo and behold, he sees four grey aliens!! Within a few days he has a conference talk booked to talk about his exciting adventure, had written up his report and published it. I didn't go for obvious reasons. The next course of action he decided to take was to tell every mutual friend on our list to make the decision, they can't be friends with both of us. Before long Nigel had lost five of his original speakers. Tony Topping however decided that an hour or so at a conference had more value than the personal friendship we had for 11 years. We met in October 2005 and continued our friendship, I even attended his fortieth birthday party. So five down and one 'win' for Nigel, no loss to me quite obviously. You can't lose what you didn't have in the first place. Brenda and Derek Savory both refused to bow to his demands and decided to pull out of the event. Kevin Goodman was relieved of duty due to him refusing to bow to Nigel's demands. As this has unfolded I can now see that I was supposed to fall out with my friends for fraternizing with the enemy. When I didn't, he issued them ultimatums to fall out with me or more precisely remove me from their Facebook friends list. Over a week or so Nigel lost five of his original line up due to them refusing to bow to their demands. All of his manipulation techniques fell flat on their face. After his visit to the forest, his demands no met, he decided to release this video. In this video he says he will be revealing the locations of the so called portals because he was given the information in channeling. If Nigel reveals protected areas there is a possibility that people will start trampling places they ought not to while trying to find these locations. It completely undermines Brenda and if the Forestry Commission become aware of this, then it will not be looked upon favorably. It will shatter Brenda's relationship with them and it could be very likely that any visits to the forest at night will be totally disallowed. I have known Brenda for eleven years, this to her will be the worst thing that could possibly happen and the responsibility of it will be on her shoulders because she accompanied Nigel to the forest. She did not invite him, he paid a visit. Nigel knows this, Brenda tells everyone the same thing. So he knows that revealing certain locations is directly against Brenda's wishes. So it is interesting that that is what he is saying he is going to do don't you think? This man who released a video saying he is not a bully after several people told him he was. I know for a fact that this is everything that Brenda Butler does not want. We could all lose out if he goes ahead and does this entirely selfish act. No one even has to turm up and i doubt that many people read and listen to his rubbish anyway. That never even has to happen, all that needs to happen is the Forestry Commission to hear about this and then the delicate agreements between the Commission and Brenda are over. The forest is owned by The National Trust and they conduct their own tours as it is part of their industry. They have all the necessary insurances etc. It is not carte blanche do what you want when it comes to the National Trust. They have a no camping on Trust land law, they don't mess about. Please do not take any notice of the things you are being told by a person calling himself 'Steve Watson'. He is behind a lot of the present troubles and will drag you into his orbit of hate with his sly actions. He is not telling you the truth. I tell you that in all honesty (even if you have chosen to call me a bully and a liar yourself -evident from your posts about me. That does not matter, only the truth of all this matters Alyson) - that makes no difference to me because I know my actions were and have always been for the good of Ufology and not to hurt anyone in the subject I love. Please listen to the decent people like Malcolm Robinson and Bill Rooke in the subject. They will talk sense to you. I can tell you that this 'Steve Watson' character is only interested in causing division within the subject and will turn everyone he can against each other. He acts immaturly towards me and Helen and then try's to talk to you in a sensible civilised manner (I have seen his posts to you), but he is using reversal of the truth tactics to do this, so that you listen to him. He knows that you are upset with me at this time and is lying to you about his sincerity. I do not need to tell you this. I could just ignore it all and get on with what I do best...Ufology and the search for truth. But he is going to end up in a lot of serious trouble soon, even though he blatantly thinks he is not, as did SC. I do not dislike you enough to ignor the fact that he will pull you into his orbit of pure vileness and you will agree to what he does and says in such an awful manner , just because you don't like me anymore. Have you not seen the photo's in emails that he sent me that I have posted? They are utterly degrading -they have been sourced and logged by the police and traced to the actual sender behind 'Steve Watson'. He says to you and others, that I have made them up to seek attention and sent them to myself! C'mon Alyson, I'. 57 years old, not a silly little schoolkid. Why would I do that if I am saying here, yet again, that I do not want anymore of this to carry on and have been asking for all this stop over and over again to these people? That is not back-tracking as he states. It is me trying to stop people listening to his lies about myself and Helen. His language is so immature that I am actually finding it very difficult to see how anyone with an ounce of sense is actually listening to him or conversing with him as you have done! After speaking with you on the show, I really did think that you were one of the more sensible and grounded people in the subject. He thinks that he will go on and on like this until I quit the subject or until I am affected by this so that my reputation is destroyed. That is just fantasy. I have been around a lot longer than yourself or SW and I can say without hessitation, now and again small insignificant people like SW come along, think they are the be all and say all, but have very little to actually offer the subject. That is the sad truth. I have proven my own worth over all these years and that, again sad to say, bugs these types of people. I have been around 35 years Alyson. That needs to sink in. I have seen it all, so what is happening with you and Steve Watson, is of very little consequence to me persoanlly. But, when it affects my loved ones and friends, then that is somethign different. Little upstarts like SW, are two a penny. They want to feel important, but they actually have nothing to offer the subject. Like he says himself, he is not a Ufologist.....so what the hell is he actually doing in the subject and commenting on it in any way? I think any sensible person knows why he is involved and what his agenda really is. It is not an important one in the whole scheme of things...just a pathetic one. The agenda (for them who have short term memory loss?) 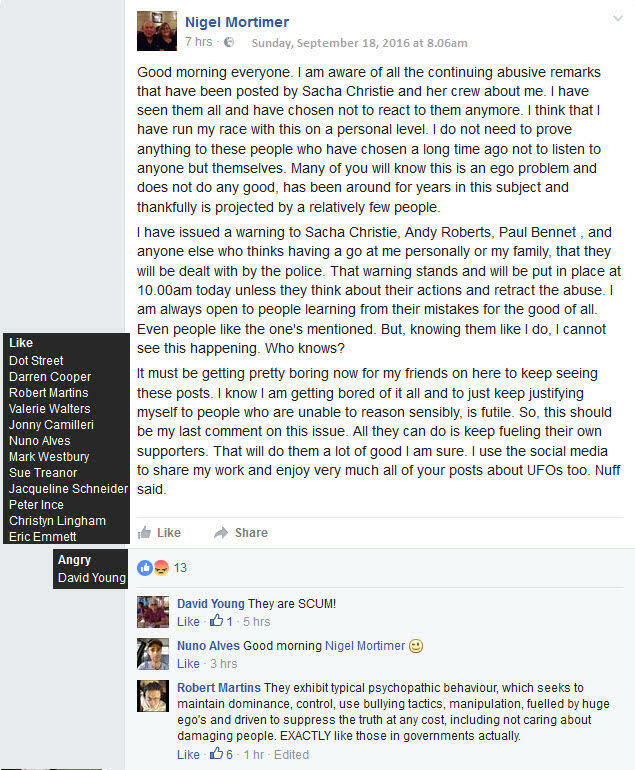 that started with Sacha Christie (and a couple of others who sidled up to her then and have raised their mugs again now) 3 years ago when I was gong to start the 'New UFO Awareness' conference (the same idea as New Ufology tbh) then, is all that this is really about. Yes, I am an easy target because I claim extra-ordinary things like channeling, psychic awareness, etc., but one thing I do not do is attack people for no good reason at the very personal level. 'SW' is just carrying on that which SC started back then, without concern for anyone but himself or others. I worked as a teacher with people like SW in schools. He is what is termed 'hard to reach' and shows all the attributes of someone with very little intelligence or forward thinking in his actions. Like he stated to me in one of his disgusting emails, ' I have been arrested by the police 20 times before, do you think I'm bothered what you do!' as if that is a badge of honour. How sad is that. How sad that you have taken on board what he says about me when this truth about him says it all Alyson. Of course, again, you can choose to do what you want to Alyson. That is your free choice and I am not bullying you into anything as you have recently accused me of. I do not believe that I did any bullying that time either and I have explained why I did what I did with unfriending and blocking people connected to SC in full already in a FB statement last week. I do not need to keep justifying that to anyone. You may choose to ignore my words and listen to those of SW, who I am certain will try to reverse all of this to his advantage, once he knows of it, and maybe you won't mind that if he does? I don't know, but I am prepared to take the chance that you will read this all through a couple of times first. What I do know is that this will be stopped soon as far as SC and SW are concerned, within months. For certain. I can't make myself any clearer than that. I hope, however, you will choose to listen to common sense and stop fueling (or listen to SW fueling SC's fire) something that is not needed in the subject. With time and a lot of healing, there could be a way back from all of this. I know many in the subject would like us ALL to show solidarity and respect for each other. I do not say that out of weakness, I say it out of respect for each other as human beings, even for people like SC and SW, who are doing a lot of this becauyse they lack the ability to focus their energies into positive things. Who knows, it may actually not be their own faults why they do this and other factors in their lives may come into play, causing them to hit out at what they regard as an easy target? And I know you and a few others promote the notion that I am to blame, when honestly I did nothing wrong at the start of it all a couple months back. SC's attacks on me and Helen came completely out of the blue as her own blog page shows! I certainly have not been attacking SC for a year like SW states. I have been far to busy to even have given her a second thought - mainly because I was moving home in that time. 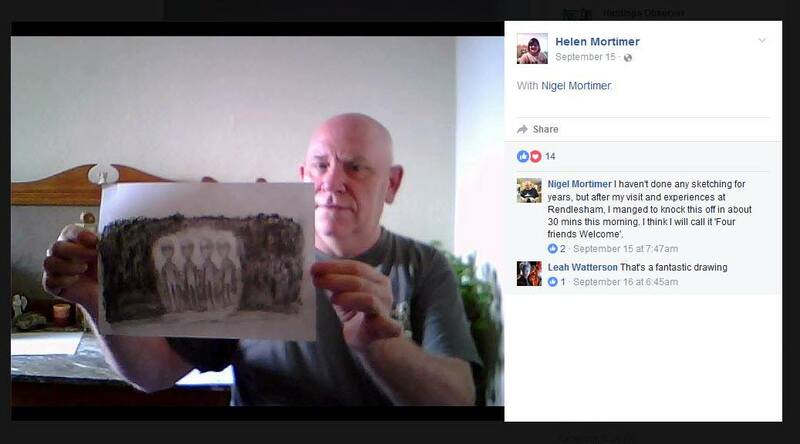 Helen and I was attacked by SC out of nowhere, because she said I stole her 'New Ufology' idea from her on her blog then went on to say I am wrong for charging for events. Both of those presumptions are wrong in themselves, but even if she did think that, they were no excuse for how she went on to persoanlly attack me and my wife with abusive commnents. The level of immaturity shown with what she says and how she says it, is beyond belief! Don't you think that most, if not all of this is childish? 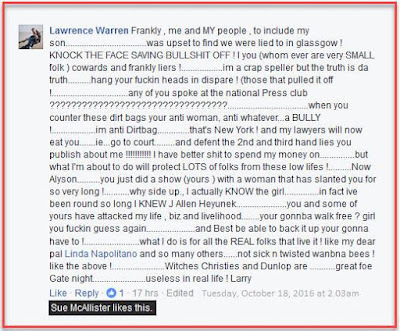 I know, that you were upset at me saying that Alyson in that FB post about Larry Warren, but I did so not to trivialise anything, but to help people see that pushing buttons with him will not resolve anything. 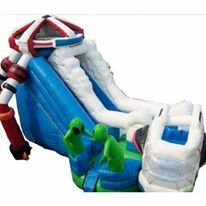 This back and forth, you attack me, I attack you, is just childish playground behaviour, and as I say, as a teacher of pre-16's who lacked basic skills in colleges and schools, I saw this kind of behaviour a lot, so I know what I am talking about. Why do you think the police are listening to me and not to SC? They can se what level these so-called experts in their fields, are actually behaving like and it is childish. Do you really want to be associated with that kind of behaviour? Yes, some of the things that LW does and says I do not agree with. And whether or not he causes trouble for anyone, 1, it is none of my business and 2, Larry's problems with SC are his own. I am not connected to them in any way like SW is saying. Ask him to prove I am and he will fall flat on his face. LW is following up his own claims of abusive attacks by SC in his own way, and from what I see and read, SC is doing the same towards LW. I can state without a shadow of doubt, no matter what reversed rubbish SW is saying to you, Larry warren plays no part in the police investigations that I have taken out on SC and SW. They are purely to do with how those two persons mentioned here have abused me and Helen for several weeks now for no good reason other than jealousy. Drek Savory is better than that. I know this from the years of work we have done together on the portals subject. I hope one day he will understand what he did was a kick in the teeth for me, never mind me bullying anyone. That was just a cop-out. Find the goodness within you Alyson, and tell this trouble causer 'Steve Watson', where to go. Preferably out of the subject and far away from us all. You need to tell him this and he may listen, because I have tried several times and he just reverses everything like an attention-seeking child. Although I am not a person who thinks disputes should be settled by means outside of listening & consideration, and I will always be happy to let the police do what they will do with SW and SC when that time arrives, I hope they are saving up their pennies - they have gone too far with me and it is now payback time. I have lost a bit of income due to the upset that those two have caused as I have not been able to focus properly on my work /writing/etc., and had a couple of talks denied me by their actions and falsehood about me, but this is all logged with the police (Watson is in for a big shock, as he does not know what connections in the force I have) and will be something I will be pursuing soon in the small claims courts. Oh, naughty me, there I go again....only in the subject to make money! Diddums....not really me is it (those who really know me, will know why I am in this subject and how much I have put into it for the good of others for years and years. So, if nobodies like SC and SC want to come along and try upset me and my loved ones due to nothing short of pure jealousy, then this is the only way I feel they will listen and maybe stop what they are dong to me and innocent others). Maybe a lesson will be learned for them & others that if you are going to make slanderous claims about people, abuse their integrity, then you need to get your facts right. I like to think that if I ever cross SW's path, he will be sorry he called me those names, lied about me in the way he has done so and the same substance that he keeps sending to me and my wife through emails, will find itself leaving a nasty taste in his throat! He is so brave behind his keyboard, but enough is enough. And when you find yourself chatting with him online Alyson, you need to remind him of this. I am not scared one little bit of his pathetic threats. I can handle myself if I need to -even at my old age, as he puts it - and maybe a bit of 'verbal' abuse in his direction is something he might understand. He certainly doesn't understand decency or mutual respect. You can tell SW, if he pisses off and leaves me alone to get on with what I do best in this subject and I have a lot of support to show that what I do do is enjoyed, respected and appreciated, I'll do the same. If he carries on doing SC's bidding while they both play the innocent game, and try to badmouth me in future, well....I have said what I have said.....they will suffer for it themselves. An eye for an eye and all that. Not my way, but I am bloody fuming with putting up with idiots who can't give anything to the subject that is of any use to anyone, so all they can do, is attack those who can. Ask yourself, what exactly have these two people actually done in the subject that benefits anyone lately? Nothing. It would be much better for everyone concerned if they took their hate elsewhere or started to actually do some good in Ufology to take it forward. If, as SC claims that I 'stole' her idea about New Ufology, why instead of trolling and attacking people like myself, doesn't she use that energy to show everyone what her own idea is all about? It may turn out to be better placed than my own, who knows,but at least she will be doing something positive for herself for once. It is obvious she is a very insecure person and she should take heed of these words. If not, her own negativity will be her own downfall in time. Same goes for SW.
None of us want any of this trouble. It is time for it all to stop. Full stop! I wish that I could say to the police today, forget it all, they've stopped doing this, but as long as SC and SW keep all of these attacks up, then I have no choice but to keep sending it all to the police as evidence of their actions. Thankfully, in the last week or so, Sacha Christie has gone quieter (or at least I have not been aware of anything more said about me from her quarter mainly due to unfriending people associated with her, so that seems to be working)and I do have some knowledge that SC has asked others aligned with herself not to keep fueling the fires using her name. I hope that is genuine and I hope that this change in direction will continue. I am not saying this in a nicer way because I want to back-track. I have said nothing and have done nothing to back-track from as far as I am aware. I am saying this in a 'better, positive 'manner, so that others might see that all I want is for all of the abusive attacks on me /Helen to stop. As I have said, there may be a way back from all of this, but that is entirely up to those involved to stop dong what they are doing wrong. Why would I be saying that to you, if I wanted to 'bring people down' or 'con them' or make things up about them...or even bully them, Alyson? Where is the logic or advantage for me in that? I know you are not a stupid person after talking with you, so please try to see what is really happening here. If you can't, please at least ask SW to act normally, sensibly and respectfully in all of this and leave me and Helen alone. What he is doing is getting a bit boring for most people now and eventually he will run out of people to 'impress' his false views upon. He needs to go out and find himself a 'magic portal' and see if he can lose himself in it so that we can ALL get some rest from his childish stupidity. That would do us all a favour. I have been reported to the police for the reaction people had to his insults. There are another 100 or so of these. Obsessed? Why? I called him out for all of the above. Shut her up for good allegiance. What alliance? We said shut her up for good ALLEGIANCE. But now it's Alyson Dunlop's turn. I am so intrigued as to how they think they can enforce this banishment of Alyson and gagging of myself. Are they going to shadow me and every time I speak blow an air horn? Stand by me all day and if the phone rings start smashing pots and pans so I can't hear anything? Every time I log on is someone going to hover over me smashing the keyboard every time I try and type? If someone comes to the door are they going to stand there saying "bler bler bler bler bler" over the conversation? Are they going to petition Mr Internet to have Alyson and I ex communicated? Where do they get this sense of entitlement from? How much power do they think they have? It would be funny if it wasn't tragic. 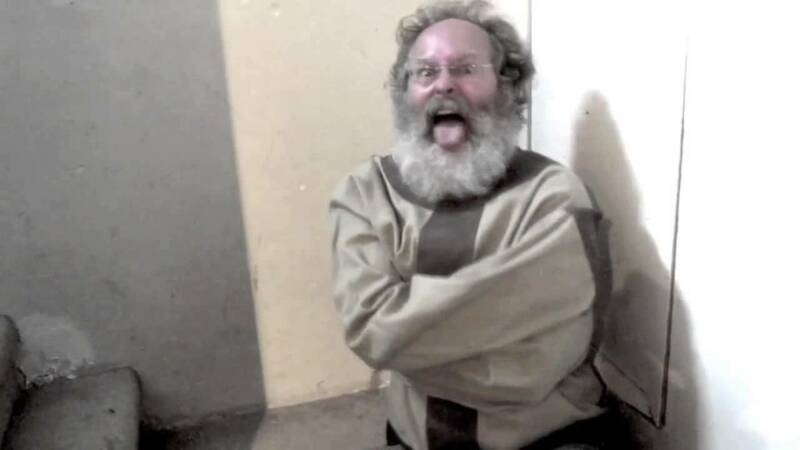 Yet they call me the ex nuthouse inmate psychotic mental case yadadadada.... Well quite obviously, it takes one to recognize another, what I am seeing is not exactly balanced is it? Gotta go, my rubber bus is here. Goodbye, Farewell, Auf Weidersehen, Hello. Back again. It's been a few days since Nigel Mortimer decided to leave Facebook, as if doing so was something akin to leaving the enterprise in an escape pod. Maybe he meant it?... Naaaah! Anyway.. He wasn't going to go anywhere without a farewell. Here it is. On Nigels Facebook post of this video Audrey (Starborn) Hewins of Starborn (experiencer) Support, FREE and Experiencers Speak conference in America, left him this message which clearly telegraphs what a stable person she is, positively flooding us off our feet with her empathy. she is right, she doesn't know anyone who associates with me, because she does not know anything about me, if she did she would see that we have a log of people in common, especially Mike Melton, voice of Starborn Support Radio. We are good friends and have been for many years. This is where larry warren starts spinning a new tale of never being told he was banned from the venue. This is clearly not true and I passed evidence on to Alyson Dunlop who is now their focus of attention, which proves they were all very well aware of the situation. I will leave it to her to reveal that little gem. The Uni Didn't Ban Me THEY Did! The University were the ones to ban him from the premises, not the members of SPI Scotland. Alyson has released all of the communications between herself and Glasgow University which clearly show the University were responsible. So the saga continues as more and more of them throw their teddies out of the pram. I'll be back with the rest of their tales of woe. Stay tuned, I just had my besom fitted with a NOS kit. I'm going to Alyson's for a game of Quidditch and a go on the Roswell Slide. Check back later, gotta go. A rare image of the Wanbna Bee Witch.